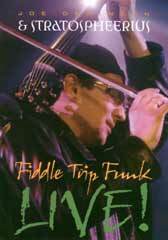 It’s the full-on electro-fiddle-trip-funk experience! Outrageous fiddler Joe Deninzon and his explosive band Stratospheerius make for an amazing live show, and now you can own your very own snapshot of their onstage pyrotechnics. Zipping through fusion forests, stopping at jazz joints, and letting the funk flow freely, their music encompasses worlds of instrumental wonder and mind-blowing performances!